Over the years, we have learned that it is only possible to deliver best-in-class customer service through building strong relationships. Regardless of size, each of our customers is handled with a level of personal care that sets us apart from the competition. In addition, investing time in these relationships also offers us insight into other business opportunities, and helps us to uncover new ways to cater to the needs of our expanding customer segments. At SONGWON, we don’t just want our customers to purchase our products; we want them to get the most value out of them. The dedicated and experienced teams are always on hand to offer customers in-depth technical support. 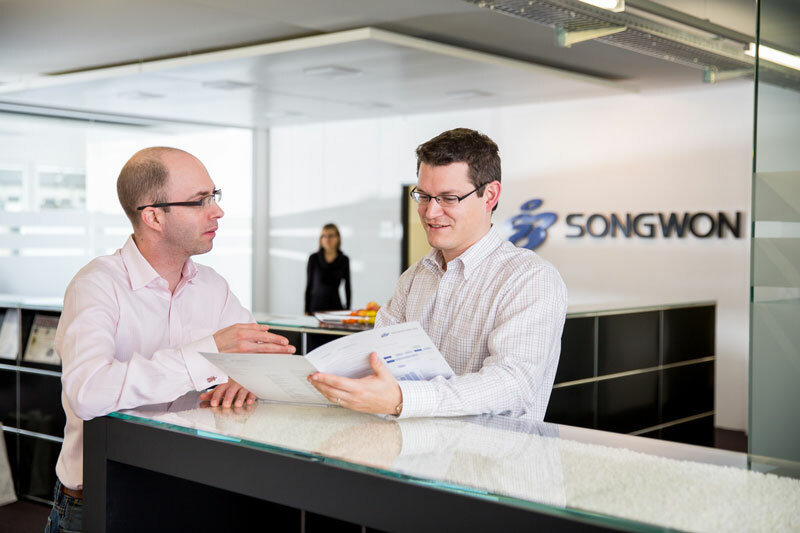 SONGWON’s Global Technical Service acts as an important facilitator between our customers, our sales teams and our internal organization – Business Management, Manufacturing, R&D and Global Application Community. Thanks to its in-depth support, we can ensure that our customers choose exactly the right product for their application. Committed to acquiring an in-depth understanding of the daily challenges facing customers and seeking new ways of contributing to their success, the SONGWON’s Global Application Community (GAC) generates ideas, drives project efficiency, provides advice on process optimization, and combines creative innovation with technical competency to bring product development visions to reality. SONGXTEND® 1102 solution is ideal for use in certain BOPP film segments where color is very critical. In 2015, it enabled one of our customers to improve the initial color of BOPP resin and maintain the color throughout the conversion process. SONGXTEND® 1141 solution is ideal for PP fiber resins, which have similar requirements in terms of color preservation as BOPP film resins. One of our customers had a special requirement with regard to gas fading resistance. SONGXTEND® 1141 met the requirement and the customer was able to implement the solution commercially in the market. ‘Light weight’ has become a key driver in the automotive industry and plastics play a major role in achieving this feature. Recently, we have seen an increased demand for glass-fiber re-enforced polypropylene (GF-PP) because it further reduces wall thickness and makes lighter designs possible. Ensuring long-term thermal stability (LTTS) of these new GF-PP compounds is challenging and the market requires LTTS levels of more than 1000 h at 150° C. Our new SONGXTEND® 2124 solution was especially designed to meet this demand and it has done so successfully. TPO manufacturers benefit from our extensive experience in light stabilization of plastics. Discover our high performance hindered amine light stabilizers (HALS) developed together with SABO. SABO®STAB UV 228 50PP and SABO®STAB UV 229 50PP meet stringent requirements in terms of low VOC, fogging, blooming, and total carbon emission. The SONGXTEND® 1301 stabilizer was specially designed to protect new polymeric flame retardants (pFR) in extruded polystyrene (XPS) applications. As the 2nd generation stabilizer for this market, it maintains better molecular weight and color of XPS containing pFR, as well as offering a broader processing window compared to the current state-of-the-art stabilizers on the market. With their excellent physical and technical properties, SABO®STAB UV 119 and specialized blends have a proven track record in the greenhouse film market, successful field trials having been carried out at key locations. They provide protection and extended film life − even where high amounts of pesticide are used.